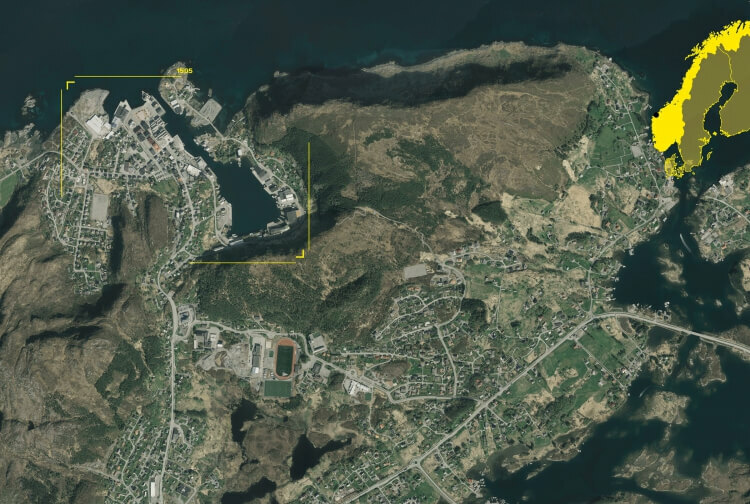 One of the main goals for a future development strategy for Fosnavåg should be to connect the town development towards the harbour and the natural bay. It must thus be opened for public traffic around the bay and new activity and programs around the unique harbour. From the time when Thomas Longva discovered the fishing bank Storeggakanten in the 1630’s, Fosnavåg has been a safe harbor near the open sea. «Våje» is a natural harbor which had it’s great days from the 1860’s until 1950’s when herring fishing went quiet. Many of the buildings, especially the boathouses and other fishing-related buildings around the bay have stood empty over long time and the decay has been visible. The shipyard hall of Voldnes Mekaniske has been demolished and the cold storage innermost in the bay has had varying activities. The unique harbor basin has been less attractive and in part without activity. This has led to a unilateral urban development on the west side of Fosnavåg. During the 20th century, several landfills has been done along the west side of the harbor and in the north-western part of the town center. The area has been a functioning communal town center for a long time. The western part of Fosnavåg is a relatively rigid grid structure where Kjøpsmannsgata is the visual connection between “new central area” and harbor. The willingness among businesses within traditional fishing industry to restructure has been formidable, and a shift toward other sea-related markets has been successful. Fosnavåg and Herøy municipality are in a special position as some of the most significant fishing industry municipalities in the country. With its shipping leagues and offshore industry, Herøy municipality is part of a marine industry cluster in Sunnmøre, but is also significant both nationally and internationally. A possible increased focus on local resources and increasing tourism will create a demand for the unique landscape and local culture. New public and informal meeting places are important for both visitors and permanent residents. The inhabitants’ and visitors’ focus on the landscape, local food, arts and crafts and business traditions will bring us closer to our own culture. There will again be a market for smaller businesses which occur as a result of a creative meeting between local culture and modern development. The development from industry to more local businesses related to service and tourism points out in the direction of focusing on local quality of the meeting between the service and the landscape. To again get younger people to settle in Fosnavågen, development of cultural and economic attractions is needed. Fosnavågen has natural, local resources and history to meet this development. When one needs to develop gear that absorbs and develops the growing interest from newcomers and visitors. This development begins with the sea and the harbor. Places and people’s perceptions of urban and living qualities arise when social and spatial conditions come into play in relation to each other. It is the impressions and experiences with such an urban fabric that give the basis for the qualities of a place. It means that personal conditions such as experience, age, value preferences, impressions of the place or similar places, have value. The physical space, the landscape and the architecture are functional goods and a sensual quality in a place. Urban development of Forsnavåg can as such not be tied to architecture and design quality alone, functionality and sustainability alone, but has to be seen in relation to how it appeals to the senses, gives experiences, and is part of creating moods and atmosphere. It is important that the work now being done is forward-looking, but equally important that it is rooted in the local historical perspective. The collective memory of Fosnavågen as an active fishing port will be important to continue. Fosnavåg center, as it is presented today, is not an arbitrary piece that can be played with, but a set of natural and anthropogenic factors, each with a story attached. The expression – Fosnavåg center currently has a great variety of dimensions and expressions used in the building environment, and it lacks red threads and unifying components. The traffic situation – Today, a lot of land is used for traffic and parking by car. This compromises clear public spaces and meeting places. Good and efficient transport infrastructure should be emphasized. Landscape – Since development for some time has turned away from the bay and a new and old part of town has been given, the basis for new development is no longer provided in the terms of the landscape. It has been a negative trend between new and old. The coastline in Fosnavågen is a unique pairing between the natural coastline and cultured meeting between sea and land. The current situation is characterized by either being natural beachside / ebb or industrial quay. How long is really the coastline around the harbor? – Roughly 3,900 meters of direct contact to the sea. Proposed plans for massive fillings in the sea provide an undesirable leveling of the coastline, which provides fewer contact and activity points along the bayside. The potential of the existing coastline in the harbor should be further cultivated and made longer – not refilled and shortened on. Fosnavåg is missing point of contact with the sea which can be a hybrid between the natural and the purely industrial. The potential may be fulfilled through making good transitions between land and sea where recreation for the people in town are in particular emphasized. In these transitions, the city by the sea can also recover its identity.